Haloes are usually caused by the refraction of sunlight (or moonlight) as it passes through cirrus clouds. The ice particles in the cirrus clouds that produce these beautiful displays are almost always in the shape of hexagonal plates or columns. 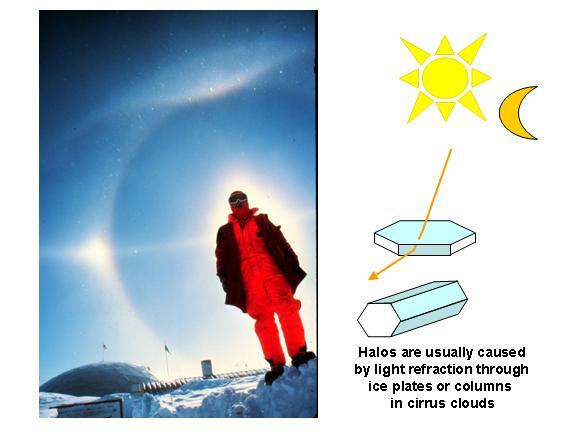 As these ice crystals fall, they often have a preferred orientation, which also affects the kind of halos and arcs that are displayed. Most halos are positioned at an angular distance of 22 degrees from the sun. As in the photograph above, parhelia ("sun dogs") are often seen on the right and left sides of the main halo, and an "upper tangent arc" is sometimes seen at the top of halo. In-depth descriptions of a wide variety of atmospheric optical phenomena, including stunning photographs and computer simulated images of the various kinds of halos, can be found here.